Developed by Turbine for Windows. 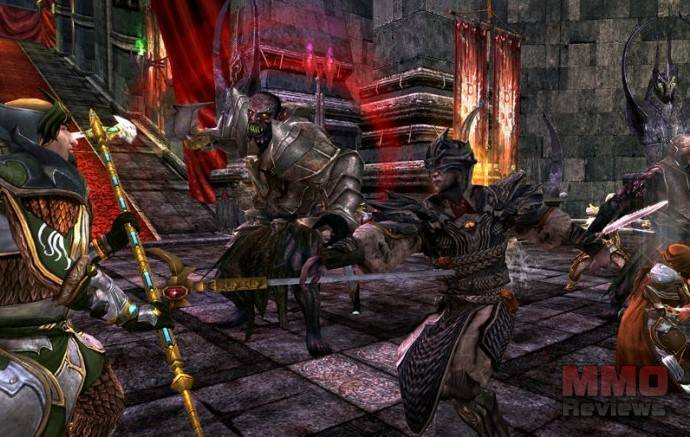 The Lord of the Rings Online (LOTRO) is the first massively multiplayer online role-playing game (MMORPG) set in the world of J.R.R. Tolkien's The Lord of the Rings. LOTRO takes place in a persistent online world populated with real and computer players that continue to function even when you turn the game off. One benefit to playing LOTRO is the large player pool, which provides many options when players are looking to enjoy the game with other people. Another great benefit is the frequent updates that Turbine releases in order to expand and improve the game. However, taking advantage of this content can be difficult without a proper understanding of the game functions. The stout Dwarves of Middle-earth are known for their steadfast determination, hearty strength, and commitment to all things found in the world's deep places. There are few recorded deeds of Hobbits until late in the Third Age of Middle-earth, which is just the way Hobbits would prefer it. They are simple, quiet folks, preferring to dwell in hillside holes in and around the area known as The Shire in western Eriador. Throughout the ages, the deeds and struggles of the noble race of Elves have been entwined with the very history of Middle-earth. They remember all too well the devastation caused by the tides of evil that once darkened the land - a shadow which threatens to do so once again. The shortest-lived of the races of Middle-earth, yet also the race destined to rule in the years beyond the Third Age, the race of Men is defined by their relatively short life span. Their mortality was considered a unique gift, but in time it became known as "The Doom of Men" and a source of lamentation. A keeper of ancient lore and otherwise lost knowledge, the Lore-master uses his knowledge of the lesser and greater powers of the world around him to stave off the advances of the shadow for a time, and to treat the wounds and suffering of his companions. In dire need he can use this knowledge to hurt his foes; but this task being extremely difficult, a wise Lore-master would rarely attempt it. With song and tale, a Minstrel brings hope to places thick with gloom. She can inspire those with desperate minds and heavy hearts to great deeds. In battle, she can turn the tide with songs that strengthen her allies and dirges which strike fear into the hearts of enemies. Woodsman, pathfinder, and master of the bow, the keen-eyed Hunter can use his arrows to devastating effect from a distance. Archery is not the only thing the Hunter excels at, for he can lead his companions through the forest at greater speed than they could on their own, and can set up traps to ambush enemies. A stealthy trickster, the Burglar can dart in and out of the shadows to befuddle, weaken, or damage foes. An unexpected strike from behind by a burglar can stun or trip enemies, allowing others in his party to combine their efforts for a devastating attack. Bearing her banner into battle, a Captain provides hope and leadership to her fellows, inspiring them to greater deeds. A skilled Captain can rally a party back from the brink of defeat, or seal a victory against many foes. A doughty fighter and protector of the weak, a skilled Guardian can face even the toughest foes and survive. The Guardian is one of the few classes willing and able to try to draw more blows onto themselves, so they can retaliate with devastating maneuvers in response. A true master of arms, the Champion excels at combat, focusing on little other than destroying her foes. The Champion's whirling blades can strike fear into the heart of even the foulest orc, cutting down swaths of their numbers at once. Able to utilize the true power of words and writing, a Rune-keeper can devastate enemies or inspire allies. Rune-keepers wield elemental Rune-stones which are covered with writing. Through these stones and other tools, the Rune-keeper is able to harness runic energy and rain destruction or restore morale. Devoted to slowing the encroaching evil of Sauron, the Warden protects those who cannot protect themselves. A fierce determination to succeed at her given task inspires the Warden, and allows her to keep up her own morale through even the darkest of battles. In The Lord of the Rings Online, crafting is broken up into seven Vocations, and each is made up of three Professions. The name of the Vocation should give you a pretty solid idea of what they do. Armourers make Armour for example. The seven Vocations are; Armourer, Armsman, Explorer, Historian, Tinker, Woodsman, and Yeoman. Defending the Free Peoples from the dangers of Middle-earth is hard work, and sometimes an adventurer needs to stop to relax and enjoy a quiet moment away from trouble and turmoil. Hobbies are a great way to unwind in Middle-earth! A Hobby is an activity that you may choose to participate in for fun or for profit! Similar to LOTRO's crafting professions, a hobby allows players to experience more of the world of Middle-earth and interact with it in new and exciting ways. - Risk the most challenging 12-person raid ever devised against the Nazgul Lord, Lieutenant of Dol Guldur! It is a decent game, but be careful! They are name nazi’s and made me change my name because I had the work Fetish in it. The title of a Disturbed song in considered inappropriate in a T rated game that includes Blood, Gore, Violence, and the use of Alcohol and Drugs (even though they claim it is just Tobacco). A little overbearing especially considering I had just purchased the expansions so that I could create the character in question… Play at your own risk of getting censored for no reason. This old game is still better than most newest games. Also it is constantly upgrading (the review above is kind of outdated). If you haven’t tried LOTRO yet or not played it in years, you should download it & give it a try, it is worty. It is also 1 of the few games that you really feel like a hero regardless your gender (females are not portrait as helpless princess in need of rescue or table dancers). They can be strict about names if you attempt to use swearing or brands in your name construction, any other name get a pass if you are not on the roleplaying servers. It is T rated because the game is about a war.